Kodak Black was denied bail when he appeared before a judge in Broward County on Friday afternoon. The “Tunnel Vision” rapper, born Dieuson Octave, was arrested in Florida late Thursday evening and slapped with seven charges ranging from child neglect to weed possession and grand theft of a firearm. The serious charges were laid out against him while he was serving a one-year house arrest sentence for a previous case and let’s not forget that he was on probation. His attorney asked the judge to grant him bail but Broward Judge Joel Lazarus denied the request and ordered him back in the slammer. Cops obtained a warrant and raided his Broward County home on Thursday after someone tipped them off about his antics on Instagram Live. The prosecutor says someone called the cops after noticing weed and a gun in close proximity to a child while Kodak Black was on Instagram Live. Police then got a search warrant and swarmed the home where they uncovered marijuana and the weapon. The feds also took his cellphone all while it was still live streaming on Instagram. Kodak Black was charged with neglect child without great bodily harm, two charges of possession of weapon or ammo by a felon, grand theft of firearm, possession of marijuana over 20 grams, and two probation violation charges. These charges carry heavy penalties in Florida if found guilty and to make matters worse, he is on probation and house arrest. Kodak legal troubles are nowhere near over because he is currently awaiting trial for a previous sexual assault charge following an indictment in October last year. Last year he served a few weeks in jail for probation violation. He was lucky to be released after serving a month in the slammer because he completed a life skills course. You can now conclude that he didn’t learn a thing from that course. XXXTentacion and Vybz Kartel on the same track should be fire. The South Florida rapper, who previously claimed he has some Jamaican roots, announced on Instagram last night that he has a collaboration coming out with the incarcerated dancehall star. Rappers wanting to collaborate with Vybz Kartel is nothing new and in fact, over the last few months, we’ve heard rumors of artists like Drake and Cardi B wanting to get the World Boss on a track. The difference here is that this announcement is coming directly from the artist and not some unnamed source tipping off the media. 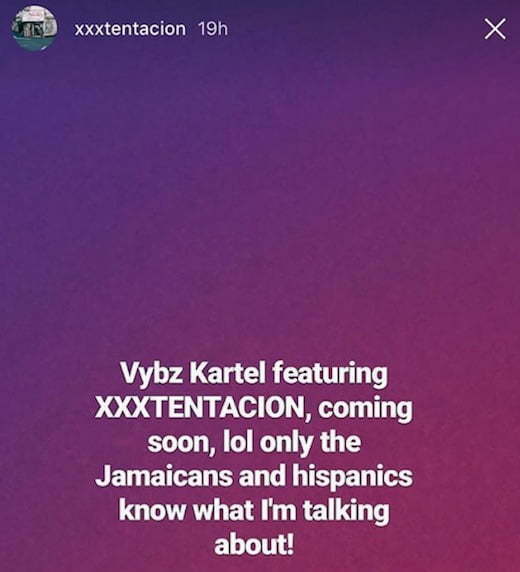 “Vybz Kartel featuring XXXTentacion, coming soon, lol only the Jamaicans and Hispanics know what i’m talking about!” X wrote on IG stories. XXXTentacion worked with Sizzla Kalonji on his “My Girl” single last year, but if this new single materialized, it will be the first time the “Look At Me” rapper and Vybz Kartel are working together. Last year XXXTentacion blast Drake for tapping into dancehall for his last two albums saying that he is way more Jamaican than Drake claims to be because his family is mostly from Kingston. There could be some truth to the story since X is from Lauderhill in South Florida where there is a strong Jamaican contingent. Vybz Kartel is currently serving a life sentence for murder but is still putting out a ton of new music from behind bars. XXXTentacion currently has a mountain of legal troubles and is currently under house arrest while he awaiting trial for kidnapping and assaulting a pregnant woman. In December, he was slapped with 15 new charges for tampering with a witness when he defied court orders and contacted his ex-girlfriend who is the victim in his case. Like Vybz Kartel, X is facing some serious time behind bars if he is found guilty of the charges. Soulja Boy is being sued by a Unauthorized for the use of an unauthorized video in one of the rapper’s music videos. The SODMG rapper was named in the new lawsuit filed by a Las Vegas chauffeur. The Blast reported that Soulja Boy filmed chauffeur and then put the clip in his music video without getting authorization. Kamilah Daily claimed that the rapper hired his company in February last year to transport himself, his manager, and director around Vegas. During the ride, Daily says Soulja Boy’s crew started filming with their camera phones while the rapper turn-up. He said at first it didn’t seem like it was a big deal until he later found out that the footage was used in his “Bling” music video without his consent. He also claimed that he requested for the video to be taken down and he was ignored so now he is suing. You can watch the video below and you will see the video in question around the 50-second mark. The 6 God came through on Friday night (January 19th) around midnight on the East Coast with two new fire singles. Before dropping the singles, Drake made a post on Instagram with what seems to be the title of his upcoming album or mixtape, Scary Hours. “Diplomatic Immunity” was produced by Nick Brongers and Boi-1da while “God’s Plan” was produced by Yung Exclusive, Boi-1da, Noah “40” Shebib, and Cardo. On “God’s Plan” he was a little calmer paying homage to his longtime friend and producer Noah “40” Shebib. “50 dub, I even got it tatted on me, 81, they’ll bring the crashers to the party, And you know me, Turn the 0-2 into the 0-3, Without 40, Oli, there would be no me, Imagine if I never meet the broski’s,” Drake raps. Earlier this month, Drake shared a photo of himself in the studio while telling his fans that his just wrapped up an all-nighter. That post triggered a media frenzy surrounding his upcoming project. The Toronto rapper usually releases his projects towards the end of the first quarter of the year. So my guess here is he will release it sometime in March or April unless there are some unforeseen delays like what happened with More Life last year when he keeps changing the release date. Towards the end of More Life, Drake rap about taking a break from music leading us to believe that it would be some time before his next album arrives. That may not be the case after all. Listen to both songs on Spotify and Apple Music.